Spend the 27th (Sat) with some fine spirits on a distillery tour. Spend the 29th (Mon) observing fascinating marine mammals with a dolphin and whale watching tour. There's lots more to do: let the kids burn off some steam at South Bank Parklands, get great views at Mount Coot-tha Lookout, see the interesting displays at Queensland Museum & Sciencentre, and admire the masterpieces at Queensland Art Gallery. 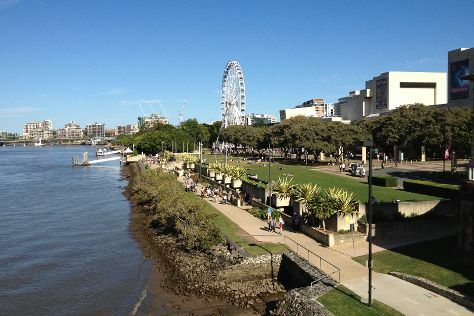 To find ratings, maps, and other tourist information, read Brisbane trip planner . Mumbai, India to Brisbane is an approximately 18-hour flight. You can also do a combination of train and flight. Due to the time zone difference, you'll lose 4 hours traveling from Mumbai to Brisbane. In April, Brisbane is slightly colder than Mumbai - with highs of 30°C and lows of 19°C. Wrap up your sightseeing on the 1st (Wed) to allow time to drive to Canungra. Canungra is a small rural town and locality in the Scenic Rim Region local government area of South East Queensland, Australia. Explore the numerous day-trip ideas around Canungra: Beaudesert Community Arts and Information Centre (in Beaudesert), Lamington National Park (Gold Coast Hinterland Great Walk, O'Reillys Birds of Prey, & more) and Darlington Park (in Darlington). There's lots more to do: pause for some photo ops at Canungra War Memorial, trek along Denham Scenic Reserve, take in the dramatic scenery at Killarney Glen, and stop by Canungra Books and Art. For maps, traveler tips, where to stay, and more tourist information, go to the Canungra online road trip planner . You can drive from Brisbane to Canungra in 1.5 hours. May in Canungra sees daily highs of 27°C and lows of 15°C at night. Wrap up your sightseeing on the 7th (Tue) to allow time to travel to Boonah. Boonah is both a town and a locality of the Scenic Rim Region in south-eastern Queensland, Australia. Explore Boonah's surroundings by going to Wyaralong Dam (in Beaudesert) and Kooralbyn Valley golf (in Kooralbyn). Spend the 8th (Wed) exploring nature at Mount French National Park. There's much more to do: get engrossed in the history at Templin Historical Village, stop by Historic Wiss Emporium, admire the engineering at Moogerah Dam, and examine the collection at Panorama Motorcycles & Memorabilia. For reviews, where to stay, traveler tips, and tourist information, go to the Boonah online trip builder . You can drive from Canungra to Boonah in an hour. Traveling from Canungra in May, you can expect nighttime temperatures to be slightly colder in Boonah, with lows of 11°C. Wrap up your sightseeing on the 13th (Mon) early enough to travel to Gatton. Gatton is a town and the administrative centre of the Lockyer Valley local government area situated in the Lockyer Valley of South East Queensland, Australia. You'll find plenty of places to visit near Gatton: Laidley (Laidley Pioneer Village and Museum & Laidley) and The Big Red Elephant (in Hatton Vale). There's much more to do: ride a horse along Fordsdale horseback Adventures, see the interesting displays at Queensland Transport Museum, make a trip to The Big Orange, and view the masterpieces at Lockyer Valley Cultural Centre. To find photos, where to stay, reviews, and other tourist information, you can read our Gatton online itinerary planner . You can drive from Boonah to Gatton in 1.5 hours. In May, daily temperatures in Gatton can reach 28°C, while at night they dip to 11°C. On the 19th (Sun), you're off toSomerset. Somerset is known for nightlife, classes, shopping, wineries, and parks. Your plan includes some of its best attractions: admire the engineering at Somerset Dam, look for gifts at Barb's Gift Shop, learn about winemaking at Mount England Estate Winery, and hunt for treasures at Fernvale C.
To see photos, more things to do, and other tourist information, you can read our Somerset day trip planner. Drive from Gatton to Somerset in an hour. In May, daytime highs in Somerset are 28°C, while nighttime lows are 11°C. You will leave for Woodford on the 25th (Sat). Woodford is a small town in Queensland, Australia, on the D'Aguilar Highway 72 km north-west of Brisbane and 24 km west of Caboolture. Step out of Woodford with an excursion to Pitstop on Mt Mee in Mount Pleasant--about 40 minutes away. Next up on the itinerary: take your sightseeing to a higher altitude at Stony Creek Day-Use Recreation Area, appreciate the history behind Woodford Leopard Tank, and stroll around Cruice Park. To find reviews, photos, more things to do, and other tourist information, go to the Woodford trip itinerary planner. You can drive from Somerset to Woodford in an hour. Traveling from Somerset in May, expect a bit warmer with lows of 15°C in Woodford. You'll set off for Bribie Island on the 30th (Thu). Venture out of the city with trips to Caboolture (Caboolture Historical Village & Abbey Museum of Art and Archaeology). To find ratings, other places to visit, traveler tips, and tourist information, go to the Bribie Island trip itinerary planner . You can drive from Woodford to Bribie Island in 1.5 hours. May in Bribie Island sees daily highs of 27°C and lows of 15°C at night. Wrap up your sightseeing by early afternoon on the 5th (Wed) to allow enough time to travel to Tangalooma. Originally a whaling station, Tangalooma Island Resort (formerly known as Tangalooma Wild Dolphin Resort) is a resort on the west side of Moreton Island in Queensland, Australia. Tangalooma is known for outdoors and wildlife. Your plan includes some of its best attractions: enjoy the sea views from Cape Moreton Lighthouse, step off the mainland to explore Moreton Island, get outside with Tangalooma Island Resort Dolphin Feeding, and make a trip to Tangalooma Wrecks. To find ratings, traveler tips, photos, and tourist information, use the Tangalooma visit planner. The Route module can help you plan travel from Bribie Island to Tangalooma. June in Tangalooma sees daily highs of 24°C and lows of 13°C at night. You'll set off for North Stradbroke Island on the 11th (Tue). Spend the 15th (Sat) exploring nature at Naree Budjong Djara National Park. Spend the 16th (Sun) exploring nature at Blue Lake National Park. For where to stay, more things to do, photos, and more tourist information, you can read our North Stradbroke Island road trip website . The Route module can help you plan travel from Tangalooma to North Stradbroke Island. June in North Stradbroke Island sees daily highs of 24°C and lows of 13°C at night. On the 17th (Mon), you'll travel back home.